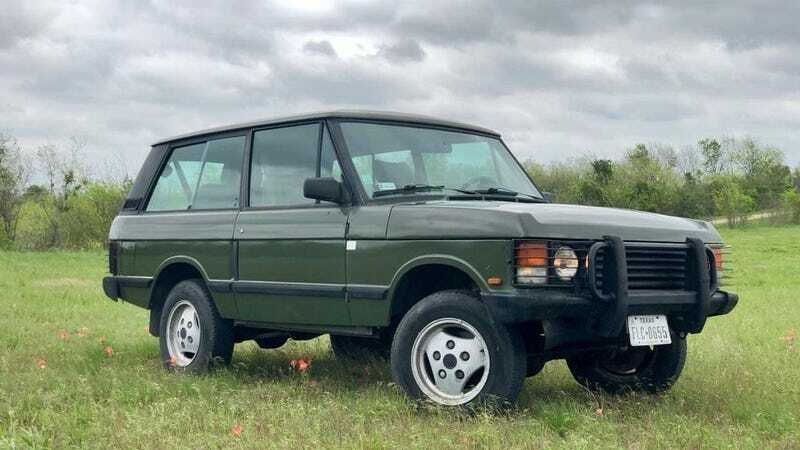 At $13,000, Could This 1987 Range Rover Get You To Love The Turbo D? ‘Needs work, but we’ll do it’ isn’t something you often hear from a car seller, but that’s just what the offerer of today’s Nice Price or Crack Pipe Range Rover avers. Let’s see if that suggested work makes the price workable. To sleep—perchance to dream… Many of us dream of sleeper cars—those whose modest looks belie a mechanical malevolence simmering just below that plain jane wrapper. Perhaps yesterday’s 1992 Mercedes Benz 500E was a little too good at hiding its true nature as a number of you passed it off as a just another W124. The 500E is not just another W124, and as such it can command a premium over its lesser cousins. Unfortunately for the seller of our Rauchsilber rocket, $30,995 was too much a premium and it fell in a 75-percent Crack Pipe loss. Maybe we should have slept on it? Sadly there’s no time for that now. Instead we now have to look at this 1987 Range Rover Two-Door Turbo D and make some decisions about its condition and how that might affect its worth. Range Rover will build you a two-door edition of its current big gun—a fancy-pants model they’ve dubbed the SV Coupe. The thing of it is, while that one-off harkens back to the original Range Rover in concept and an era when two-door SUVs were a thing, you’ll have to order yours off-menu. Not only that but the truck will set you back an eye-watering $295,000. To that I say pish-posh. Why on earth would I wait around and spend that sort of bread on a two-door Range Rover when I could have this original right now for less than 5-percent of the asking? Okay, just maybe that new SV Coupe will come with everything new-car tight and smelling of fresh dead cow and whatnot. This old-school ride on the other hand has some mechanical issues, and its aged cloth upholstery probably smells like Ted Nugent. Here’s the deal though, the original Range Rover two door is a timeless classic—I mean, just look at those funky door handles! Not only that, but this one rocks a VM Mortori 2.4 turbo diesel and five-speed stick. It’s said to have lived its life in Poland, and to have been recently imported to the U.S. with all the necessary bring-it-here paperwork already done. That’s how you get them here as all those parts I just described never officially made their way to the U.S.A..
Now, we saw a similarly equipped imported Range Rover last month, but that one was a four door and rocked a much higher price. As I noted, this one is the never sold in the U.S. two-door and that makes it even more interesting. Also interesting is that engine. The Italian-sourced turbo diesel efour pumps out 105-horsepower and 176 lb ft of torque. In the 4,400-pound Range Rover that managed a zero to sixty times in the range of… hey look at that cool dog over there! Yep, that’s a cool looking dog all right. What were we discussing? Oh yeah, the interior. The inside is all textured fuzzy cloth and hard plastic surfaces. The fit and finish on the dash is a bit suspect, and there are holes in the face where I expect one of those liquid globe compasses used to sit. The seat upholstery is abrading on the off-side piping, but other than that it all looks serviceable. If you’re expecting luxury accoutrements however, this isn’t the Range Rove for you. The exterior is decent too, with aluminum bodywork seemingly free of issue or corrosion. Appropriate three-spoke alloys underpin. Up above, the vinyl wrapping the the rear pillars seems to show no issues for the truck’s 155,000 mile life. The same can’t be said for the mechanicals, however. The ad notes that should the prospective buyer plan to use this Range Rover for actually, you know, driving, then a number of fixes should be undertaken. Those include the rear main seal; turbocharger rebuild; all the hoses; valve cover gasket; engine mounts (shaky-shaky); gearbox and transfer case seals; axle seals; brakes; body mounts; and the tires. My dad used to like to joke about cars needing a lot of work by saying that all you needed to do was jack up the radiator cap and drive a new car in underneath. That of course was back when cars had radiator caps. This RR needs a lot of work. Let me rephrase that—A LOT OF WORK—to make it reliable even by Range Rover standards. Of course you wouldn’t want all your precious fluids draining down the driveway, turning all the moving bits into a single fused stationary art exhibit, so you’d want to tackle most, if not all on that list. Here’s the thing though, the seller says their shop can take care of all of the issues noted after turning over the keys. The question: how much would all that cost, and does that make its $13,000 entry fee worthwhile at all? What do you think, does this imported Turbo D have you contemplating that $13,000 price and the work needed to get it right as rain? Or, did you find that $13,000 not working for you at all? eBay out of Texas, or go here if the ad disappears.